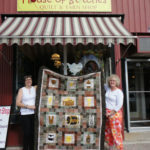 Create a set of small art quilts mounted and ready to hang! Start with a fused, raw edge small quilt to practice some threadwork; then, move to a piece completed with only the thread. Different finishing/mounting methods are presented and students can mount their pieces on a small canvas. the finished quilts are approximately 8″X10″. This is an all-day class, come prepared to play! Do you h ave a schedule for upcoming classes? Marilyn, I try to keep the Calendar page updated and have made some additions today. I am also starting a newsletter soon-interested? Send me a note through the contact me page. Thanks for your interest!